Being fifty-something, I love a knowing moment, a nanosecond in time when you know something to be true. It doesn’t have to be world-changing, just true. 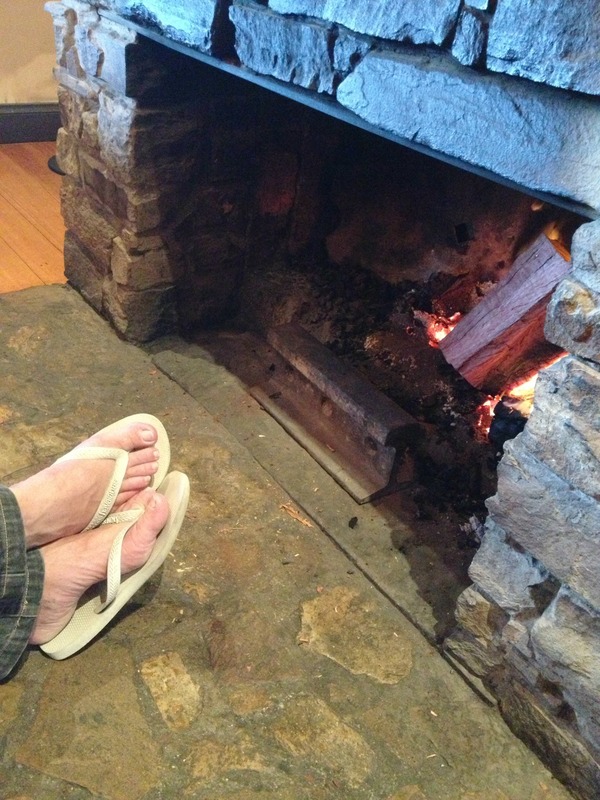 On Friday afternoon at 5.30pm, Mr P and I settled in to toast our toes by the ginormous open fire at Castlemaine’s Public Inn. 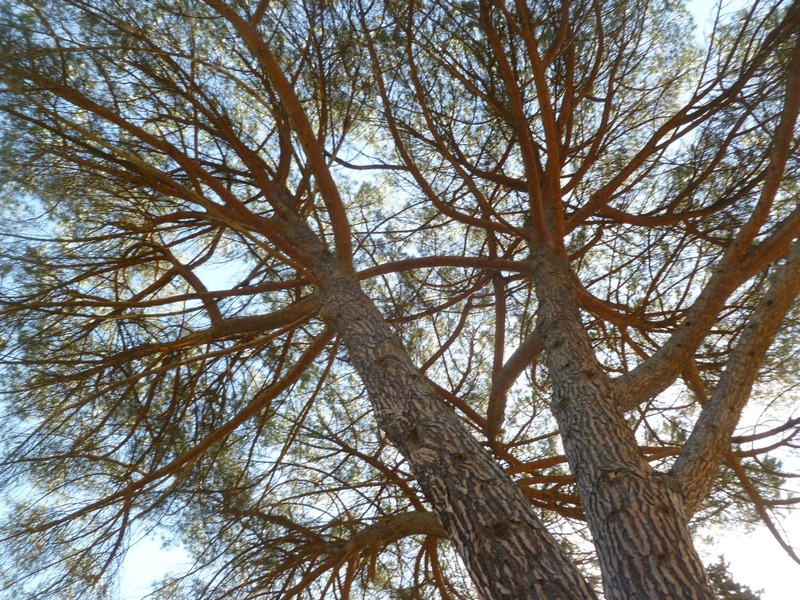 We sat at the corner of a capacious recycled timber communal table, with deep open wood grain that begged me to run my fingers over and over it. We clutched cold glasses of cold craft beer and felt the local Friday after-work-drinks crew gather around us. Right then, in that moment, I knew we’d chosen the perfect place for a weekend escape. Truly. Earlier, we’d tipped the contents of our home fridge into the tiny fridge of the little campervan that could and quickly thrown together an overnight bag. I’d vowed: no makeup, no hair dryer, no fashionista and no nonsense. We made our late morning escape (one of the perks of being your own boss). Our destination? 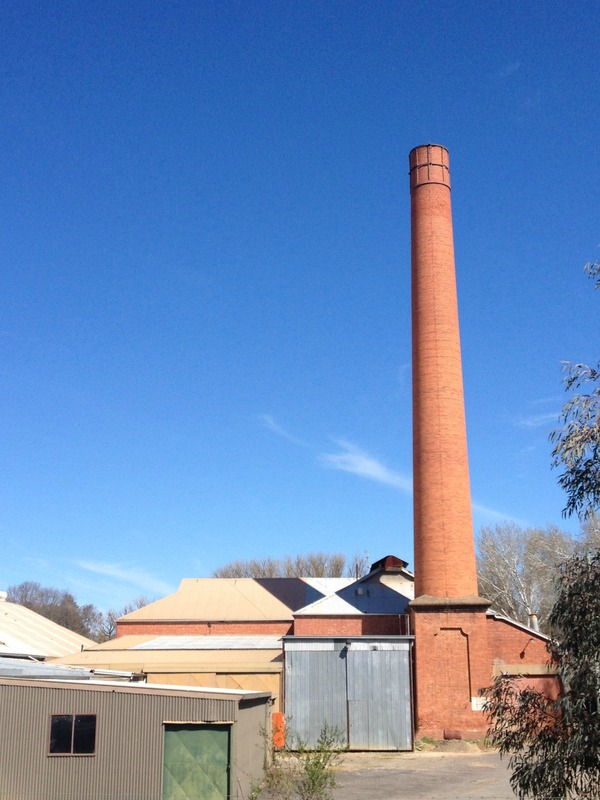 Castlemaine, a historic town in the heart of the Goldfields region. Our mission? To relax and make the time to see some stuff that we usually drive straight past. Our first stop was a pearler … a tiny picnic ground at Spargo Creek where we devoured our packed lunch amongst the bush sounds. Birdlife everywhere. Mineral springs. 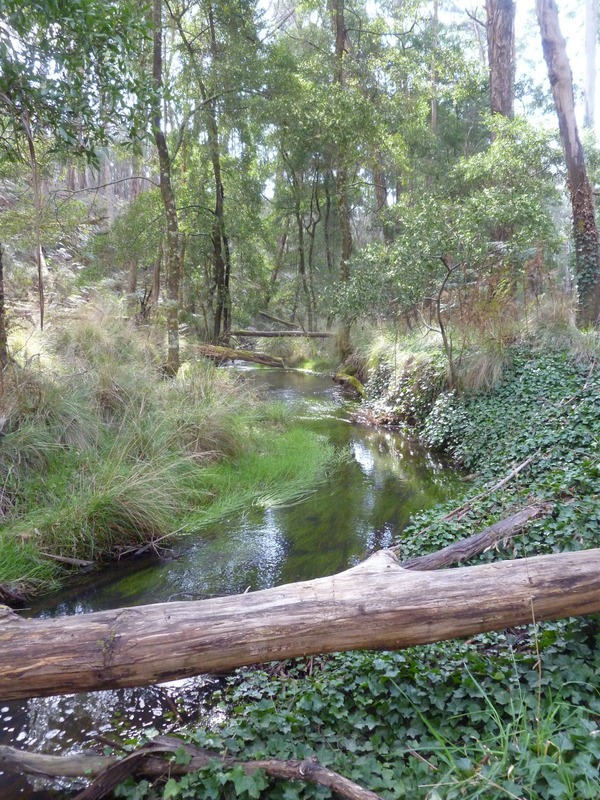 Trickling creek. Lichen-covered rocks. 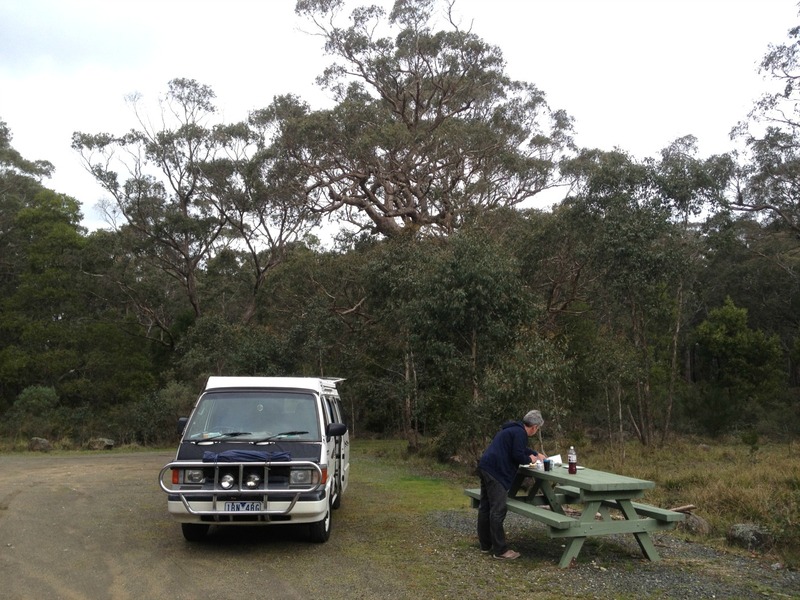 We reached Castlemaine mid-afternoon and set up the campervan at the Castlemaine Central Cabin and Van Park. 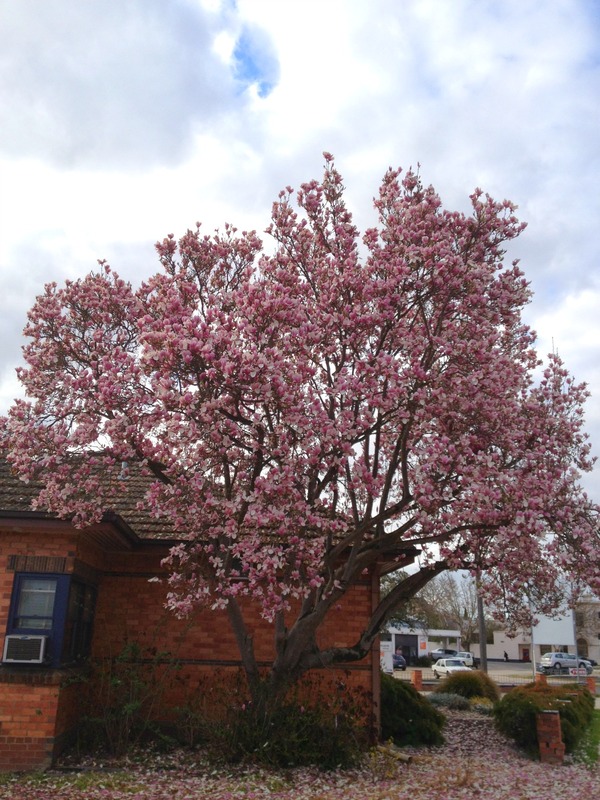 “Central” is spot-on – just a few minutes walk to the town centre, past the biggest magnolia tree. In. The. World. It’s a sweet little van park with lots of cabins and just a handful of caravan and tent sites. The amenities were spotless and complete with camp laundry/kitchen, barbecue area, picnic area and herb garden for visitors’ use. The only downside was the Melbourne –Bendigo train which thunders past (very nearby) every hour, including into the night. We live on a busy road so we’re used to transport noise but, if you’re not, this may not be the park for you. A get-your-bearings wander into the town centre before dinner took us here, to the Public Inn. To the truth of things. Then, it was back to camp to cook dinner, make up the bed, sip a Canadian whisky and read a great book. Early night makes for an early start. In the morning we headed to the Visitor Information Centre and tentacled ourselves to a knowledgeable volunteer until she shared everything she knew about the best of Castlemaine. 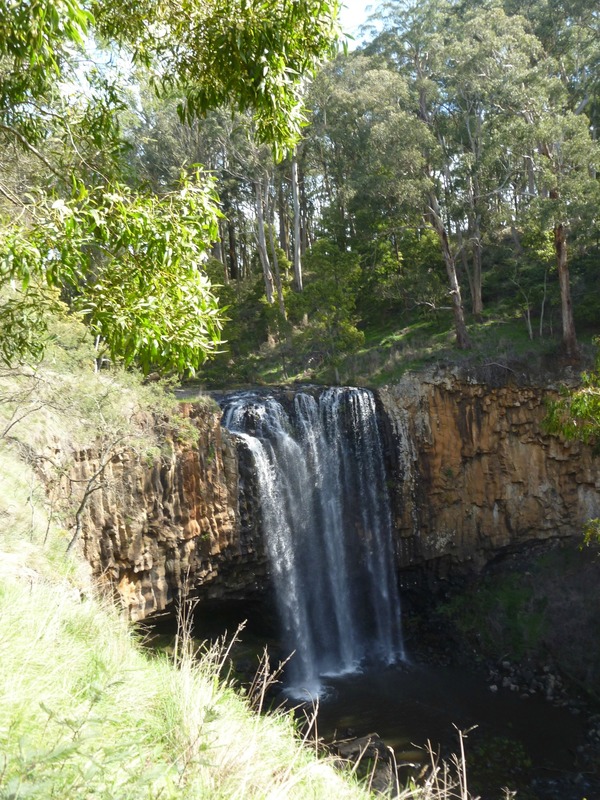 We took her advice and struck out on a brochure-guided 7.5km town walk which would take us through the Kalimna Park bushland area and around to the Botanic Gardens. The map guided us up the hill to the Burke and Wills monument and an expansive view back over the town. Many places in Australia claim a connection to the ill-fated Burke and Wills expedition. 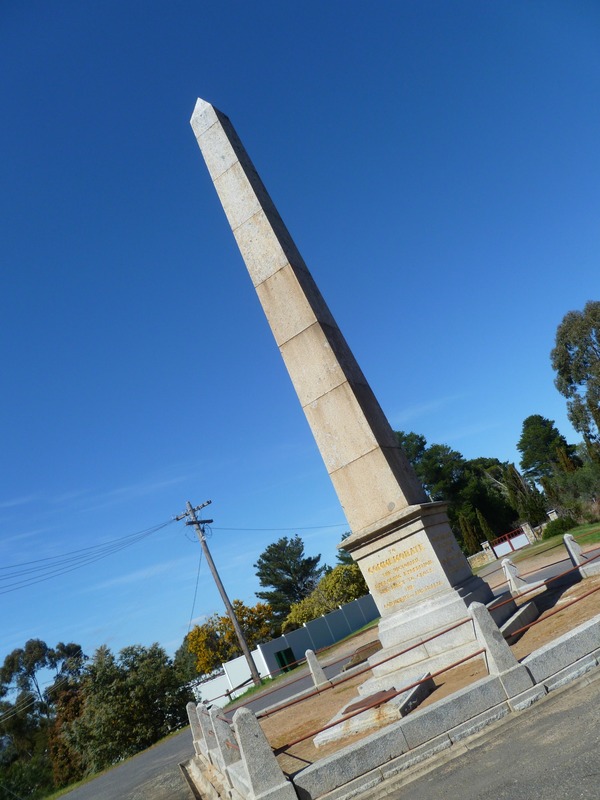 Castlemaine’s is that Robert O’Hara Burke was the local Sergeant of Police before heading off in 1860 to cross Australia from south to north. We headed off on our own expedition into the Kalimna Park bushland area. We soon lost the track of the designated walk and found ourselves on the edge of the residential zone. We’d come without water, hats or food, so decided not to risk the bushland but to stick to civilisation and find our own way across town to the Botanical Gardens. Our route took us past some of Castlemaine’s beautiful old colonial and federation homes. The Botanical Gardens did not disappoint. We hugged giant trees, relaxed by the duck pond and read the interpretative signs showing images of Victorian era Castlemanians relaxing by the same trees. A late lunch at the too-cool-for-us Bridge Hotel (grilled haloumi and flatbread entrée for me; pork belly burger with chips for he) and we were ready to head back to the van park. We sauntered past more heritage buildings, back beyond the magnolia tree. Late afternoon, we spent a couple of blissful hours reading in the September sun by our campervan, digging our toes into the grass and watching the cockatoos swooping overhead. For dinner, we’d chosen Capones, a pizza/pasta place within walking distance (bruschetta and lambrusco for me; piled-high pizza and non-craft beer for he). We wandered back through the night, past the magnolia tree and settled into the cosiness of our campervan bed for more reading and more Canadian whisky. Bliss. Screeching cockatoos (and maybe a thundering train) woke us early. We packed up and hit the road, deciding to take the long way home, avoiding the highway. Taking the road less travelled. 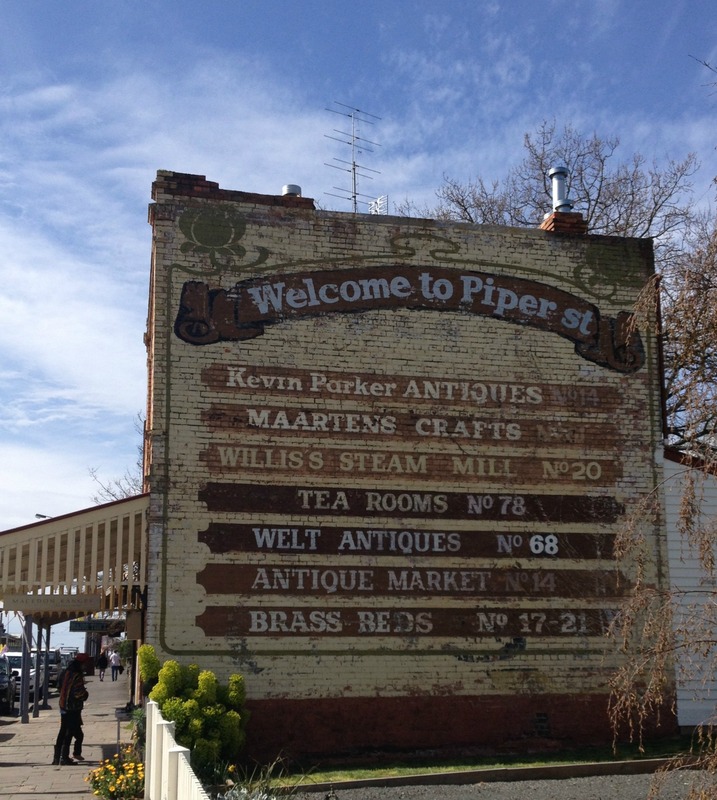 At Kyneton, we explored famous and history-filled Piper Street. Specialty retailers, foodie spots and vintage shops abound and we spent an hour or so browsing. It was high-end and a tad too expensive to tempt us to flash the plastic, especially during this year of buying nothing new. 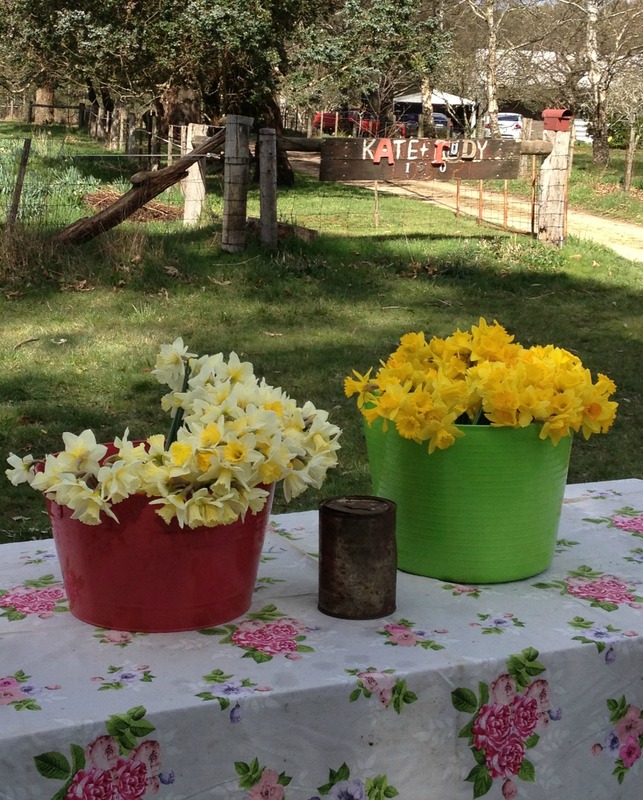 snavel some farmgate dollar-a-bunch daffodils. Our escape had been brilliant and blissful. No nonsense. No crowds. No fuss. Plenty of little moments of truth. 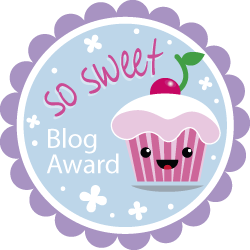 Loved reading this blog Sheryl…in fact I enjoy all your blogs. This one in particular though bought back some lovely memories of a similar journey we took in August last year. We too visited the Red Beard Bakery and the Trentham Falls but cannot possibly remember what we ate, but I know we sat with our backs to the wall of the gloriously warm oven. Piper Street Kyneton was also part of our travels, but I DO confess to spending there! Thank you, for bringing back the images of my old stomping ground, as I am originally from Bendigo. 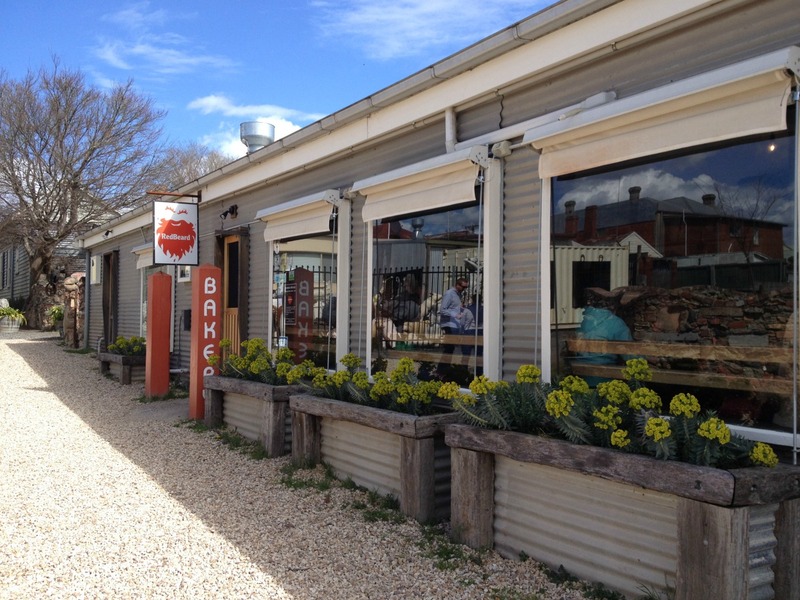 I recently travelling through Castlemaine and it was as if time had stood still. It is a wonderful old town with plenty of history. Aren’t the Visitor Information Centres the best? 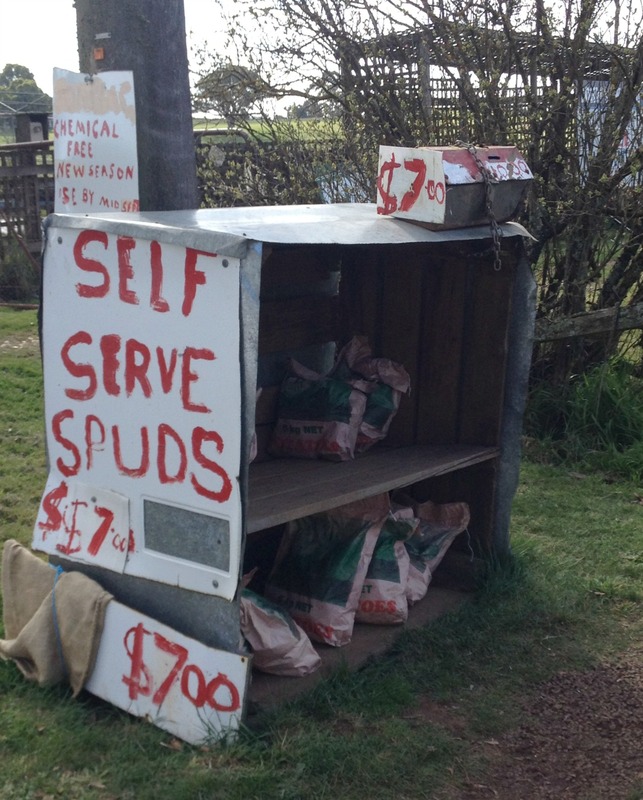 We used them all the time whilst we were travelling around Australia in our caravan. I have a similar blog to yours called http://www.50shadesofage.com. Thanks, Kathy. We love the Visitor Information Centres. Those volunteers put their hearts and souls into sharing the best local info. I actually follow your blog and love reading about your travels (and dreaming of doing the big loop ourselves some day) and your “senior moments”. 🙂 Thanks for popping by. S.